Achieving a great night’s sleep with CPAP therapy happens when you take an active role in your own therapy. That means being in tune with how your therapy and equipment are performing – and how they should be performing – from night to night. 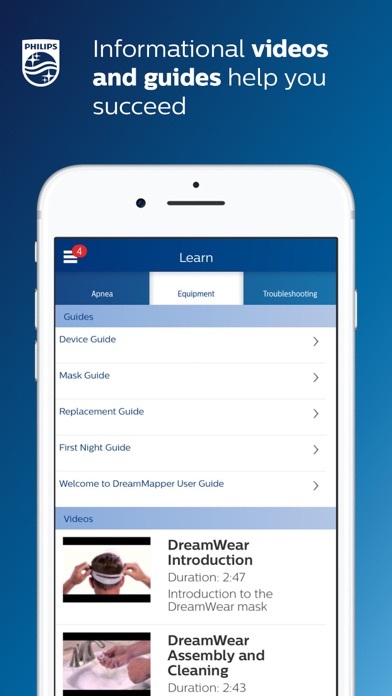 DreamMapper is a mobile and web application that keeps you actively informed about your previous night’s therapy – with information like mask fit and therapy hours – so you know you are getting what’s needed for the great night’s sleep you deserve. 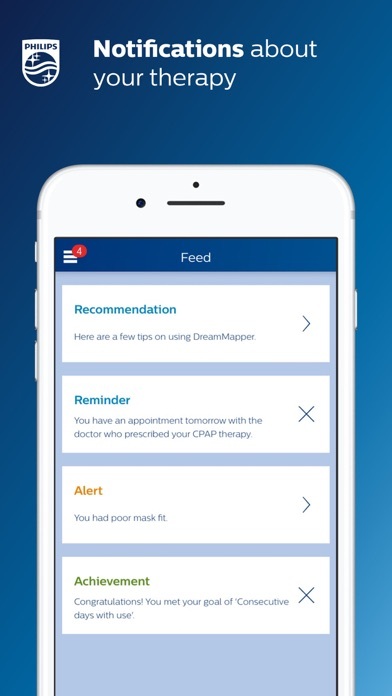 DreamMapper provides all of the following: • Bluetooth® data transfer from your Philips PAP; • Daily feedback about your treatment and your therapy results; • Personalize your treatment management by setting alerts and personal goals; • Find the answers to your questions through a rich content including informational videos and guides; • Receive notifications about your therapy and your DreamMapper compatible equipment; Learn more about DreamMapper and the Philips devices it supports at www.dreammapper.com. Philips CPAP devices treat Obstructive Sleep Apnea (OSA) so that you can sleep better at night and be more active during the day. Part of the Dream Family DreamMapper is part of the Dream Family from Philips Respironics. The Dream Family offers innovative, comprehensive sleep therapy technology like: • DreamWear: It looks different because it is different. The ingenious open-face design provides exceptional comfort with an optimal fit, easy freedom of movement and the ability to choose your most comfortable sleep position. DreamWear is User-friendly in every possible way. • DreamStation: Embrace your care with confidence with our most innovative obstructive sleep apnea (OSA) technology. With easy-to-navigate menus, remote diagnostics, a sleek, compact profile and incredibly quiet operation, DreamStation helps make it simple to start, customize and continue your OSA therapy. • DreamStation Go: Whether you’re traveling for business or venturing out on the vacation of a lifetime, DreamStation Go provides an easy, reliable and portable PAP experience for users who refuse to compromise. 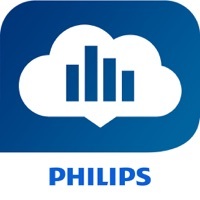 Philips DreamMapper has access to the following permissions: Location Approximate location (network-based): This is to set up Bluetooth communication. A location is required to acquire the pair. Photos/Media/Files Read the contents of your USB storage: This is needed to access the scanned and stored image that the camera takes of the Device Serial Number (DSN). Camera Take pictures and videos: Used to scan the DSN. Other reasons Receive data from Internet: DreamMapper needs to communicate with its Data Center. View network connections: Wi-Fi setup as well as the need for DreamMapper to communicate with its Data Center. Pair with Bluetooth devices: First-time connection to another Bluetooth device. Access Bluetooth settings: First-time connection to another Bluetooth device. Full network access: DreamMapper needs to communicate with its Data Center. Prevent device from sleeping: Prevents the phone from “going to sleep” while playing videos. Good app but occasional connection issues. I wish they would improve on it. Android version no longer connects :-( but Apple version works good. How come every other Bluetooth app connects without problems and DreamMapper has consistent problems? Cannot connect to server, try again, unpair connection...come on Philips, you’re a huge corporation! Should we try another brand for our next CPAP device? Is Philips Respironics going out of business and they don’t care about consumers? Read the app reviews! 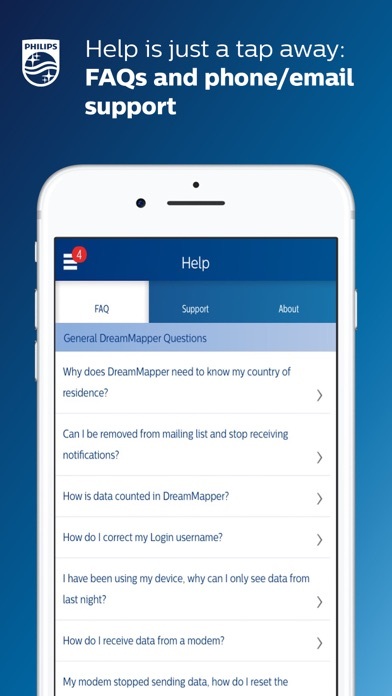 Fix this DreamMapper app, you’ve had long enough! The app worked great for a month. Now I get error messages more days than not. Fix the server. Whatever! I spent a lot of money to get the DS & DSgo. I want to see and manage my therapy. Next machine will be one with decent a app. It’s a fine app, but doesn’t sync with Apple Health app which was disappointing. No matter how hard I try, the App does not link to my iPhone or iPad. It is so frustrating. I have tried repeatedly, and others including my sleep tech have tried and it does not work! As with several other apps it seems to work more smoothly with the iPhone. If it continues to work better than the Android app, I’d give five stars! I’ve had this machine for a few years. From day one it’s had Bluetooth issues. It just refuses to connect after a few days. The process to reconnect is tedious. So much so, that I have just given up trying to use the app at all. Very disappointing. I’ve had this app for about 2 1/2 weeks. At first it was great. Then after a few nights for no reason it would no longer connect automatically through Bluetooth. I went through the tedious process of unpairing and then re pairing, all seemed fine. And then a few nights later it happened again. Last night as I was going to bed I allowed the app to do the update that specifically said it was an update to correct the Bluetooth bugs. This morning I woke up to the same message of check Bluetooth connection. I unpaired and re paired several time. Then followed the directions found in the app to delete the app and then reinstall the app. And now it simply won’t pair at all. With any other app I’d be completely done at this point and give up because I don’t have time to deal with apps that don’t work as intended, but since this particular app is supposed to be keeping me informed about my 4 yr old child’s sleep quality while using his new medical device I will continue to struggle on until I can once again gain access. I have had the app for a few years and ridden the continual roller coaster of Bluetooth connection glitches. Occasionally it works. Majority of time it does not. I have done workarounds, reboots, delete and reinstalls, unpair, re-pair, and the results remain transient. I have tried with my iPad, iPhone 6S, iPhone X and the results are consistently inconsistent and frustrating. Great concept. Useful on the rare occasions that it works as intended, but mostly useless. Ugh. Why limit the list of supported countries. You ship your product all over, yet I cannot create an account because my country is not listed. As others have noted, this app can be extremely inconsistent on whether it works on any given day. Some days it downloads your data just fine. Some days it won’t work at all; other days it downloads prior days but not the current one. Earlier this week (Christmas 2018) it wouldn’t download data for three days, then on Thursday it downloaded those days but not the current day and it’s now 24 hours behind. Very strange. When it works, it’s useful to confirm whether you’re sleeping soundly, and that’s why I gave it three stars. There is really no acceptable reason for the operational issues, though. Edited to add: Now in the second week of January 2019 it’s getting weirder and I’ve knocked it down to two stars. On Monday it didn’t download. That’s not unusual, but then on Tuesday and Wednesday it showed Sunday night as zero hours despite displaying Monday and Tuesday night’s properly. Monday finally showed up today (Thursday morning), but now last night shows as zero hours. This is really absurd how random the behavior is. Edited again 2019-02-08: This week’s app update was touted as making downloads more reliable. Can’t say as it’s great, though. It worked fine for two days but is now back to its old habits—this morning no data appeared even though my machine shows 8.5 hours. Edited again 2019-02-18: Following up on my prior edit, the software update doesn’t seem to have changed anything. Current day still shows up blank. Edited again 2019-03-23: Seems fine now as it’s worked every day for the past two weeks, so I’ve adjusted my overall rating. I’m attempting to set up my Bluetooth connection on my system but you app goes directly to an account LOG IN page. Why would I necessarily need an account to set this up? The app is well designed & easy to use but it is conspicuously lacking HealthKit integration. 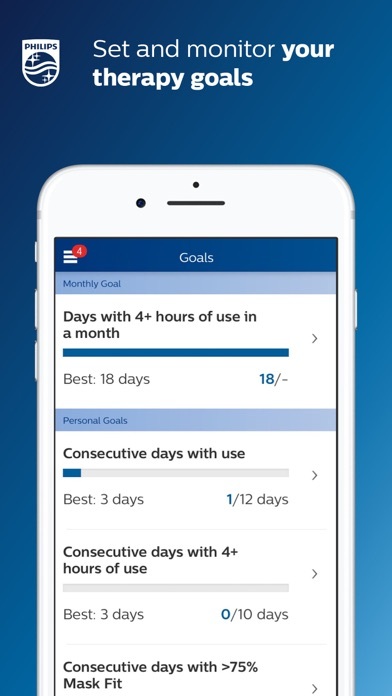 Philips please add HealthKit integration to the app! This app is a personal privacy data security failure. The data is collected by Phillips and store/used/sold to 3rd parties for Phillips benefit, not mine. There appears to be no way to prevent my privacy data from being collected and used for purposes other than my treatment. This is all about collecting data for marketing and sales for Phillips. 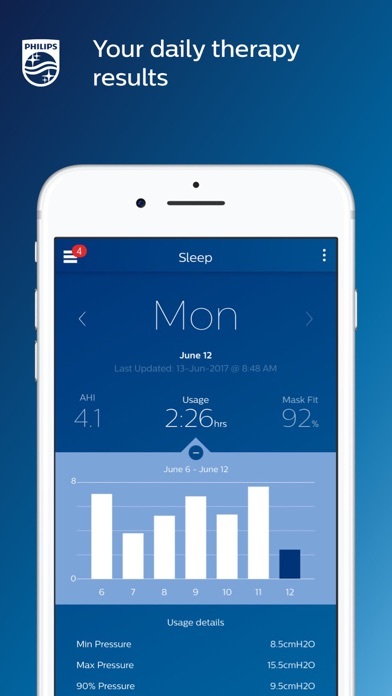 This is a fantastic companion app for sleep apnea; you should add REM sleep detections and advance alarms like sleep cycle so that you can truly begin to see the full picture of the users sleep. Can’t get the app to download onto my phone, IPhone 8. Outstanding piece of equipment. Easy to use and some of the best sleep I have had in a while. Everything worked well through my last download this past August. With the updated app, the iPad is paired to the CPAP and after 20 - 40% download it immediately stops and takes one back to the app. Have gone through all Bluetooth trouble shooting and from what I've read in reviews, it appears to be the app. I'm not spending another minute flogging a dead horse and guess I'll await the next update. The app gives informative, detailed data to monitor progress. But on 2/20/19 it stopped reporting. When the app opens, a message says “Check your Bluetooth connection.” I always do that first. I have even told the iPhone to “forget” the DreamStation and re-paired it, twice, with no change. I have also emailed Support; they have not responded. Next step is a phone call—I want my app back! Worked most of the time but now the app closes after downloading 20% on my iPad. The blue tooth connection on this app has been terrible. We sent an email to the manufacturer to see what we were doing wrong. We received no answer. My husband started experimenting to try and figure out how to connect, and he had the same bad experiences as a lot of people listed in the reviews. However, he finally found that if he laid my smart phone on top of the BiPAP, and punched the app icon, it downloads the data, and shows on the screen most of the time. My DreamMapper app on iPad has failed to display the data. I no longer receive my daily stats. I’m very disappointed in how little information this app provides. It is very basic data from their PAP devices. And there is no means to transfer data to the Apple Health app. Barely worth the time to download. I’ve done everything I can do to get nightly information but it doesn’t work! I can have days of missing sleep data. DreamMapper used to reliably connect to my CPAP and display the data each day when I opened it. Now it still connects reliably each day and seems to upload the data but most days the data doesn’t display. However, the data displays the following day. Very frustrating to have to wait a day to see the data. This needs to be fixed! If it weren't for the app I wouldn't have continued past the first day on the new mask. The app gave me the data I needed to keep going. It is the only reason I kept going. I could see the dramatic improvement that I would not have guessed was happening. Thank you to the developer team. It works. This app is frustrating. It never uploads new data to my iPhone 6s Plus even though it says it does. It is always two days behind. You have to continually sync it and after many tries it finally updates only for the past two days of data to disappear the next day. I try logging out and back in, repair the Bluetooth connection, deleting and reinstalling the app etc. Nothing works. My phone’s operating system and the Philips app are both on the latest version. If I could give it negative stars I would. Update 2/19/2019: this app is getting worse. The last week of data disappeared and now it doesn’t refresh at all. Contacted Support and didn’t hear a thing. Screw you Philips. I like to see my activity daily. For over a year things worked great. Recently, the app sporadically pulls updated information. It may go three or four days without updating the data. I uninstalled and reinstalled the app. Aside from this issue, the app is easy to use and understand. Gene C.
In the beginning it displayed the nights results. Now it SEEMS to send the info BUT that info is not displayed until days later. I DO want to see my AHI info to see how the machine believes I am doing. I have called support snd am told there are problems, but they do not know when they will be fixed. I find I am becoming less inclined to look. I am counting on the machine sending the info and my doctor monitoring it. Considering Phillips makes the equipment and is responsible for the app, this is a VERY SORRY state of affairs. I love that you can synchronize the data is Bluetooth but it seems to be glitchy. It doesn’t always record or transfer the data and I’ve used the mask. Not sure what is up with that but it’s annoying. This CPAP app used to work pretty good with an iPhone in 2017, now it takes up to 1.5 weeks to have it show up on my phone. It looks like I’m not the only one having problems. Very disappointing, lots of wasted time trying to get it to work. Definitely need a quality check on software before releasing it online. New to CPAP, so was excited to see I could monitor my results via iOS app. Paired with my iPad, and for several days- perfect. But past few days, says there is no new data, machine is only keeping the current night. However, doctor’s office says all the dat is there. So, what’s up with the app ?? App used to work great, now when you open the app it says new data being received but the the data says zeros all the way across or nothing at all. New data will not upload till the next day. As I have seen with a few other reviews, the app is hit or miss(usually miss) in terms of actually populating the interface with data. It connects to Bluetooth and says it has downloaded fine but it just doesn’t display recent data. Maybe once in a week it will “catch up” and show everything. It is like the app just can’t hold more than a few weeks of data, because it worked for the first month or so and then started acting like this. Unfortunately it makes the app pretty much useless. You have to check your stats on the DreamStation itself. They should really have the developers go through and test the app with a high volume of data and then fix it...please. Even if I can see the Bluetooth transfer the app does not update with information until 24-48 hours later. Last update made it nearly instantaneous for about 4 days. Now it’s back to slow.. This app used to work great. Each morning I could see how I slept and use that data to adjust the mask straps, etc the next night if needed. Now this app does nothing. It uploads the data but doesn’t show it for days or weeks at a time. “Poor Mask Fit” doesn’t do me much good 6 days later. Get this piece of junk fixed. Data uploads are annoyingly intermittent since 2.17.1 was released. Each update I hoped it would be better, but no change. Data is consistently three days behind. Without timely data to compare how you physically feel after sleeping, this app is useless. Below: my previous review until I downloaded the update in Feb 19. Using bluetooth download no longer works. It crashes the app. Period. Cannot email customer support in the app because the contact page falsely tells me that my email address is invalid. Prior to Feb 19 update; Most every morning, I tap the app to let it do it's thing and download the information. I'm a bit of a numbers nerd, especially when it concerns me and my health, or how well I may have slept the night before. Really cool to be able to record and read the results and trends. I've let a few friends look at my new machine, and the app. A couple of friends are interested in getting it. It works every time ----important helpful information! I have to agree with most fo the negative reviews. The app’s ability to pick up data from the previous night is, at best, random. I typically get all zero or “—-“. And forget about contacting support. I have made three attempts to email support over the past two months, and gotten zero response. Nice machine. Crappy app. No support. Updated the app Feb. 5 2019 and since have not recorded any data. Need to fix this as I use this app often to monitor my sleep habits. The app was updated recently and worked for a little while but now it does the same thing. Fails to register the information until sometimes days later. Please fix this! I love being able to track my CPAP usage on my iPhone, but the app doesn’t always pick up all of the data. It is great when it works, but frustrating when the machine says X hours of use, but the app shows zero. This happened on 2 days this week. At first this app was amazing. Steadily over the year it has stopped connecting intermittently and now won’t connect maybe once for every 10 tries. If you get a version that works then DON’T UPDATE THE APP! It seems like someone didn’t run their regression tests before making updates live. I never get daily updates like I use to. Today is 15 Feb. I only have data showing up to 10 Feb. I like to see how I slept because it gives me and idea of how my day will go. Right now I give the app a 1 star, I give it 2 stars since I get data that at least a week old which I guess is better than not getting any data at all.